The goal of this study was to investigate the effectiveness of the filters in removing harmful contaminants purported to be present in smoke vapor. This is performed by comparing filtered smoke vapor with unfiltered smoke vapor and comparing them for their presence of possible harmful chemicals. A laboratory setup was constructed in which the mouthpiece of the smoking device was fixed to tubing leading to a cold trap containing an organic solvent at low temperature. Inhalations were simulated using a vacuum pump and timed valve. The settings were made such as to represent the smoking behaviour of a typical adult person. 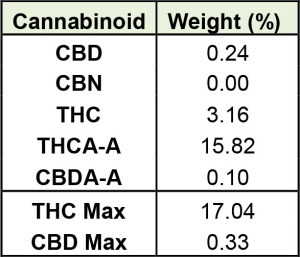 In The Werc Shop’s experience, this may be considered an average result and is relatively representative of other typical medical cannabis strains present in California. The influence of the filters was investigated by using the smoking device as described in the accompanying instructions (see appendix 1), while comparing this data to the same setup without filter materials present. In both cases, water was present in the inhalation device. The experiment was repeated three times without filters and three times with filters. In each experiment a total of 1200 mg (+- 20 mg) of dried plant material was smoked within three sessions of 400 mg each. The plant material used was moderately peeled apart with multiple smaller pieces included in each cycle. The material was not blended nor ground to a powder, provided this would not accurately represent the burning behavior of plant material in a real life situation typical to a medical cannabis patient’s use. The large amount of sample (1200 mg) used in each experiment is considered to be sufficient enough to negate variability within the plant material in each experimental sample. Between experiments, all glassware, including the inhalation device, was cleaned with acetone and water. When filter material was used, the material was replaced with fresh filter material following each experiment. data against the National Institute of Standards (NIST) mass-spectral library of known chemical entities to provide a tentative identification. Any subsequent confirmation of the components was performed using a known commercially available reference standard. Figure 1 below shows a comparison of the collected smoke produced by the inhalation device with and without filters. A clear influence of the filters producing a definitive difference in the chromatogram was observed. 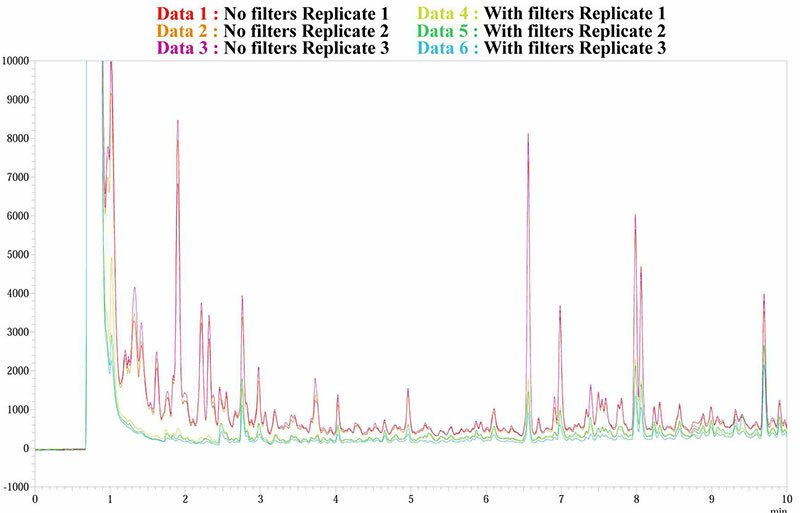 Figure 2 below shows a close-up of the chromatograms demonstrating the results of the three replicate experiments with filters and the three replicate experiments without filters. The experiments appear very reproducible and a clear influence of the presence of filter material is observed. To confirm the observations of above, the filters were removed from their housing and the trapped components were extracted following the experiment. 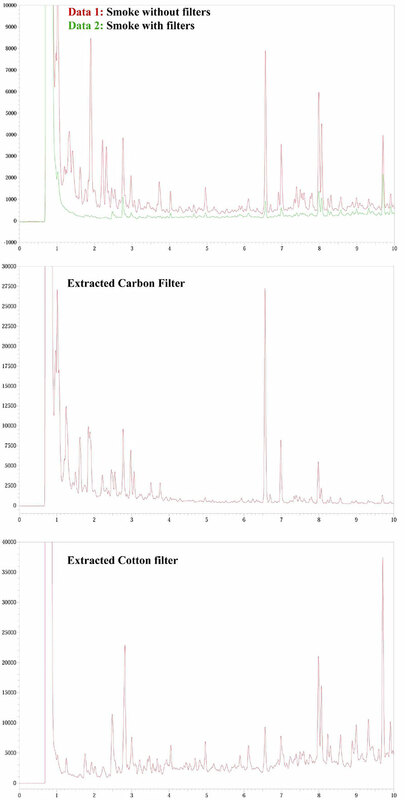 The chromatograms of the unfiltered and filtered smoke are shown, as well as the chromatograms of the extracted filters. This data clearly shows that the “missing” compounds in the filtered smoke were trapped in the filters, and not lost in the analysis. that was strongly reduced when using the filters. Figure 4. 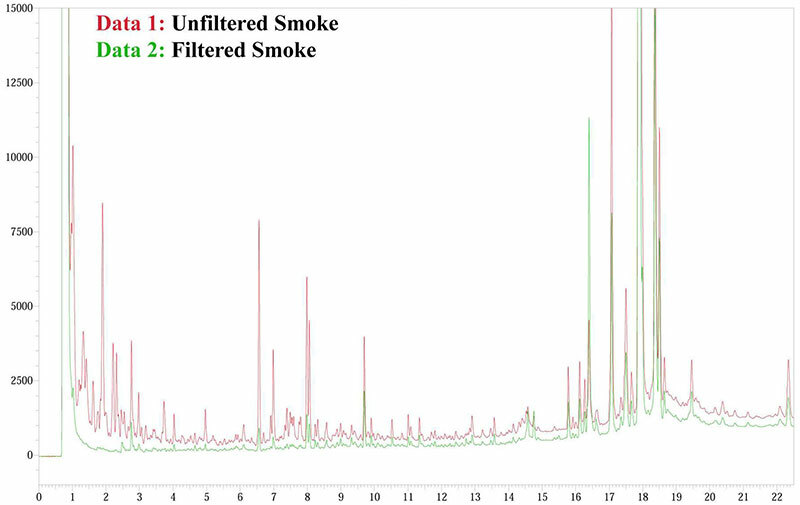 Overlay of chromatograms of filtered smoke, unfiltered smoke and naphthalene reference standard. Figure 5. 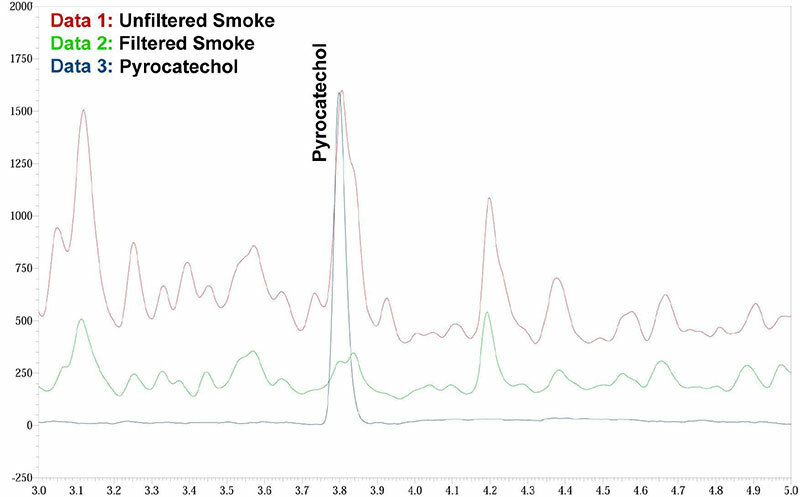 Overlay of chromatograms of filtered smoke, unfiltered smoke and pyrocatechol reference standard. Proposition 65 as cancer causing agents. Further studies of the device intend to identify additional harmful components which are removed by the filtering system. Special attention will be given to known carcinogens. Quantification of various chemicals found will be attempted in order to determine the relative performance of the filtration system.